All Sangenic Tec Advanced Nappy Disposal Systems now work with the plain white and plain grey Sangenic Tec Refill Cassettes. The new Grey cassette is made from 98% recycled plastic. Tough on odour but not the environment It's our aim to reduce our impact on the environment by making all our cassettes from recycled plastics. Will this cassette fit my bin? 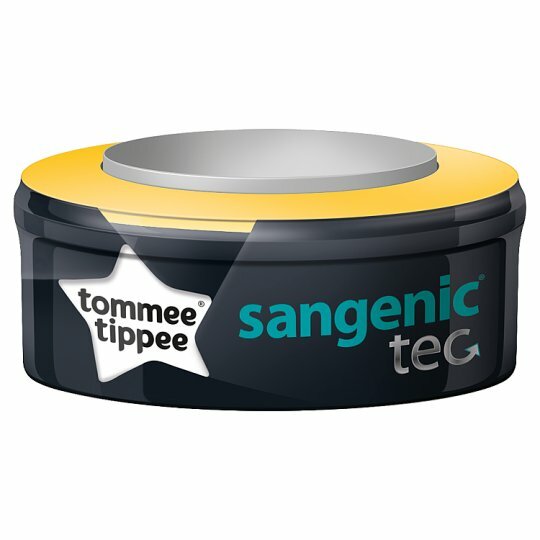 Sangenic Tec refills are only compatible with the Sangenic TEC disposal system. They are NOT compatible with the Simplee Sangenic disposal system. Both Grey and White Sangenic Tec refill cassettes will work with the Sangenic Tec Nappy Disposal Systems. Our multilayer antibacterial film kills 99% of dangerous germs like e coli and Staphylococcus Aureus. On contact, it also stops proteins being broken down by bacteria, a process responsible for lots of the nasty smells. The new Grey cassette is made from 98% recycled plastic*. Tough on odour but not the environment It's our aim to reduce our impact on the environment by making all our cassettes from recycled plastics. The compact size of the bin means it fits into any room and holds up to 28 nappies~ allowing you to store nappies for 4 5 days. 1. Pull film evenly out of the refill cassette. 2. Push the film through into the bin and remove the bin lid. 3. Tie a knot in the film. For such a tiny person your baby can generate a lot of mess! The Tommee Tippee Simplee Sangenic nappy disposal bin is the simple, stylish and space-saving solution for keeping your baby's room, clean and odour-free. Multi-layer film and a smart seal lid keep nasty odours contained, saving you numerous trips to the outside bin! The nursery bin is suitable for the disposal of nappies, cotton wool, wipes and sanitary products. Biomaster protected - Film is treated with Biomaster silver biocide tested to ISO 22196:2011. Please use biocides responsibly. Material listing: Polypropylene, HDPE film. WARNING! Plastic film can be dangerous. To avoid suffocation keep plastic film away from babies and children. Do not store in or near babies' sleeping area. WARNING! For adult use only. Do not allow your child to play with this product.